L. Lippard, Pop Art, London, 1966, p. 94, fig. 72 (illustrated). L. Lippard, Pop Art, Munich and Zurich, 1969, p. 96, fig. 63 (illustrated). R. Crone, Andy Warhol, New York, 1970, no. 30 (illustrated). J. Coplans, Andy Warhol, Greenwich, 1970, p. 26 (illustrated). Moderna Museet, New York Collection for Stockholm, Stockholm, 1973, no. 3117. R. Crone, Das Bildnerische Werk Andy Warhols, Berlin, 1976, no. 32. A. Revy, Louisiana Museum Zeitschrift, 1978, p. 34, fig. 72 (illustrated). B. Kerber, Bestände Onnasch, Berlin and Bremen, 1992, p. 68 (illustrated in color). R. E. Krauss and Y.-A. Bois, Formless, New York, 1997, fig. 30. U. M. Schneede, Amerkianische Pop Art in der Hamburger Kunsthalle, Hamburg, 1997, p. 29 (illustrated). G. Frei and N. Printz, eds., Andy Warhol Catalogue Raisonné: Paintings and Sculpture 1961-1963, London, 2002, pp. 83-84, no. 70 (titled ["The Lindy Tuck-in Turn-Man"], illustrated in color, p. 80). New York, Stable Gallery, Andy Warhol, November 1962. Berlin, Nationalgalerie, Aspekte der 60er Jahre, February-April 1978, pp. 107 and 141 (illustrated). Zurich, Kunsthaus, Andy Warhol, 1978, p. 68, fig. 30 (illustrated). Berlin, Martin-Gropius-Bau, Der unverbrauchte Blick: Kunst unserer Zeit in Berliner Sicht, January-April 1987 (illustrated in color, n.p.). Paris, Centre Georges Pompidou, L'informe: le modernisme à rebours, May-August 1996, p. 95 (illustrated in color). Basel, Fondation Beyeler, Andy Warhol: Series and singles, September-December 2000, p. 71 (illustrated in color). Berlin, Neue Nationalgalerie; London, Tate Modern and Los Angeles, Museum of Contemporary Art, Andy Warhol Retrospective, September 2001-August 2002, p. 120, no. 72 (illustrated in color). "I always wanted to be a tap dancer, just like Betty Ford and Barbara Walters." (Andy Warhol quoted in Andy Warhol's Exposures, 1979, unpaginated). Warhol's Dance Diagram paintings are a rare group of works dating from the early 1960s that reflect the artist's fascination with both popular culture and the concept of self-improvement in modern industrial society obsessed with image. Painted at the same time as the series of Campbell Soup Cans with which he was to make a name for himself, Warhol's Dance Diagrams, along with other 1962 portraits of advertisements for body-building and beauty such as Before and After 3, Dr. Scholl and Wigs constitute an important thematic area in his work that reflects contemporary ideals of grace and beauty. At the same time the Dance Diagrams are distinct from these other 'beauty' paintings by the fact that they are instructional diagrams for movement. In this they reflect the conceptual influence of Robert Rauschenberg and Jasper Johns' work on Warhol's art. 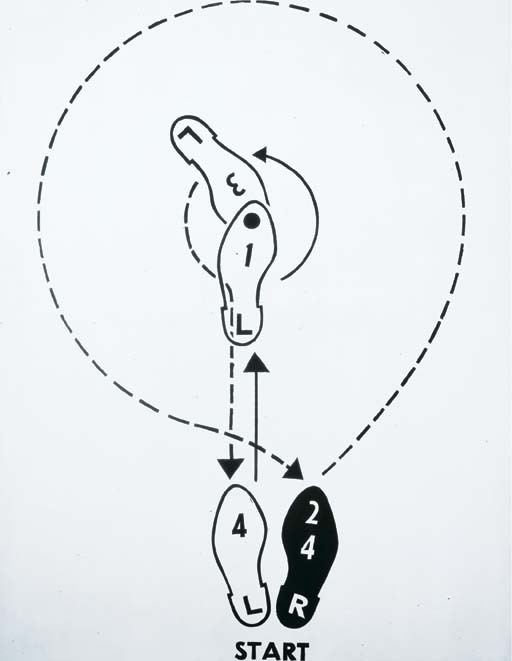 The Dance Diagrams are based on images found in two dance books published by the Dance Guild in 1956: Lindy Made Easy (with Charleston) and Fox Trot Made Easy. Warhol copied these diagrams from these two books, but rather than painting them freehand, as was his usual practice during this early stage of his career, he traced the diagrams onto the canvas in the same way as he had done with the Campbell's Soup Cans for the Ferus Gallery. Warhol's choice of this diagrammatic source material in some ways reflects Jasper Johns' concern with painting reality and the "real" world of "real" things rather than the "imagined" gesturalism of the Abstract Expressionists. Johns was "interested in things which suggest the world rather than suggest the personality things which suggest things which are rather than in judgements. The most conventional things, the most ordinary things - it seems to me that those things can be dealt with without having to judge them; they seem to me to exist as clear facts not involving hierarchy" (J. Johns cited in R. Francis, Jasper Johns, New York, 1984, p. 21). Before it was regarded as and given the name "Pop" Warhol's art was considered part of a "New Realist" tendency. In the Dance Diagrams Warhol takes Johns' notions one step further by representing a real thing - the instructional diagram - that also points to an abstract act of grace and beauty in the form of the dance. In doing this, Warhol may also be parodying the pretensions of Abstract Expressionism, - once known as "Action Painting" - which also relied strongly on the beautiful act or gesture. Implicit with the Dance Diagram is also the notion of a do-it-yourself form of self-improvement; something which lay close to Warhol's own heart. Like, the body-building adverts or even his later painting-by-numbers landscapes, the D.I.Y. diagram reflects the pressure that modern society exerts on the need to be beautiful as well as to conform and fit in. Warhol, a timid gay man, extraordinarily self-conscious of his own self-image, felt this pressure more than most. With their diagrammatic illustrations of the foot movements to a well-known popular dance, the Dance Diagrams are like secret instructions from a sorcerer's manual that seem to promise a transformation and to open a doorway onto a world of grace, beauty and perhaps even romance. Looking like absurd Picabia-esque mechanical diagrams and somewhat like Robert Rauschenberg's 1951 collage Should Love Come First?, the Dance Diagrams are among the most conceptually sophisticated of all Warhol's works. Warhol aimed to heighten the Dance Diagrams' conceptual relationship to real space by exhibiting them horizontally on six inch high wooden blocks laid on the floor. Transforming these paintings into sculptures in a way that anticipates his Brillo Boxes and even the work of many Minimalist artists, the exhibiting of the Dance Diagrams in this way encouraged the viewer to imagine the graceful gestures of the dancers taking place above this simple iconic pictogram. Warhol included the Dance Diagrams in the two major exhibitions with which he made his New York debut. These were the New Realists exhibition at Sidney Janis Gallery and also his one-man show at the Stable Gallery in November 1962. Dance Diagram ("Fox Trot") represents the diagram of the leading role taken in the "Lindy - Hop" the famous dance originally known as the "jitterbug" that came to fame during the Swing era. For many years and in many catalogues including Rainer Crone's 1970 catalogue raisonné, this work has been erroneously referred to as Dance-Diagram "Fox Trot". As can be seen from a photograph of the opening of the Stable Gallery exhibition, this work was one of only two Dance Diagrams exhibited at this exhibition where it was displayed opposite its counterpart, Dance Diagram ("The Lindy Tuck-in Turn- Woman") now in the Moderna Museet, Stockholm.